Women are extraordinary creatures and deserve to be treated as such! At Kathy's Boutique,YOU are the reason we are here! We love it when our daily deliveries arrive and we scurry to open the boxes to see what's new today! We hope you love our newest arrivals as much as we do! Girls Night Out, Kathy Means Trunk Show, Black Friday Shopping, Home For The Holidays, Ho! Ho! Ho! Shop & Go and more! Click here for our event listings. Keep up to date with latest arrivals, events information and news from Kathy's Boutique. We respect your privacy and we promise not to spam you. Need an After hours appointment? Kathy and the girls always make me feel so welcome when I'm in the Boutique. I know each time I go in that I'll find pieces that I can't live without. A true asset to Athens and Henderson County. The great thing about shopping at Kathy's Boutique is "it makes me look good". No joking, when I buy gifts for my wife, mother and daughters, Kathy already knows what they like and want and that makes me look good!. Thanks Kathy! Kathy's Boutique is the place to shop for classy clothes, unique jewelry and gifts, and oh my....the SHOES and BAGS!! Of course Girl's Night Out is the highlight of the month in Athens. Truly a great staff. You will find great styles, great prices and great service at Kathy's Boutique! Both the clothing and the wide variety of accessories; handbags, jewelry, shoes, and gifts are all of exceptional quality. Probably half of my wardrobe is from this delightful shop. 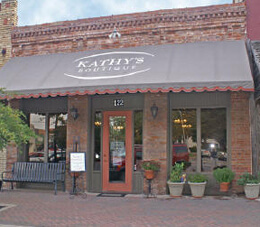 Kathy and her team provide unbeatable service, so be sure to stop and shop Kathy's Boutique!